Go keyless with Codelocks: why use keypad locks? The development of new technology for door locks has come a long way since the first basic digital lock was introduced over 20 years ago. Until then, the only legal way of gaining access to a locked door was with a key. Since their introduction, keypad locks that use push buttons instead of keys have become a very popular choice – and for good reasons. Before the advent of keypad locks, if you were in charge of securing all of the doors in a large building, such as a hospital or a school, you would have to carry around a large bunch of keys and spend considerable time walking around the build to lock and unlock doors. Keypad locks enable you to control access with codes instead. One problem with door keys is that they can get lost or stolen. When door keys go missing you have to pay for new keys to be cut, or worse, pay for new locks to be fitted. Digital coded door locks enable you to control access by entering a four, five or six digit number. If you forget the code a new one is issued without incurring any cost. A coded door lock acts as a “red light” to help deter unauthorised access. Rather than issuing a key for every door where you need to restrict access, you can simply issue a code. Employees can access areas out of bounds to the public without having to carry door keys. Entering a code into the door lock is quick and easy. And if an employee leaves the organisation, you can simply change the door code. Both mechanical and electronic coded door locks are available. A top of the range electronic door lock can do much more than simply control access to a door. Additional features such as tamper time out, alarm and remote release functions provide additional user benefits. We’ll be writing more about these features in next week’s blog post. For controlling access to locked doors, it’s easy to see that keypad technology has made a positive impact. Digital push-button locks are easy to use and offer a much more convenient way of implementing access control than using keys. 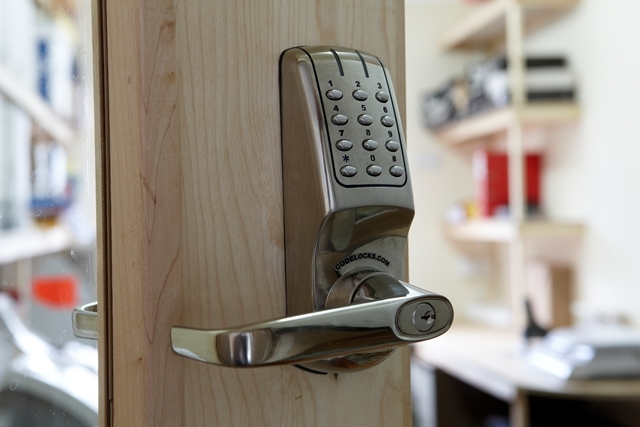 Next time you are thinking of changing a door lock, why not upgrade and go keyless? We have an extensive range of mechanical and electronic digital door locks to choose from. If you need help selecting the right keyless door lock for your door, please give us a call on 0800 393405 or visit our website. ← No code required – welcome to our new digital lock blog!